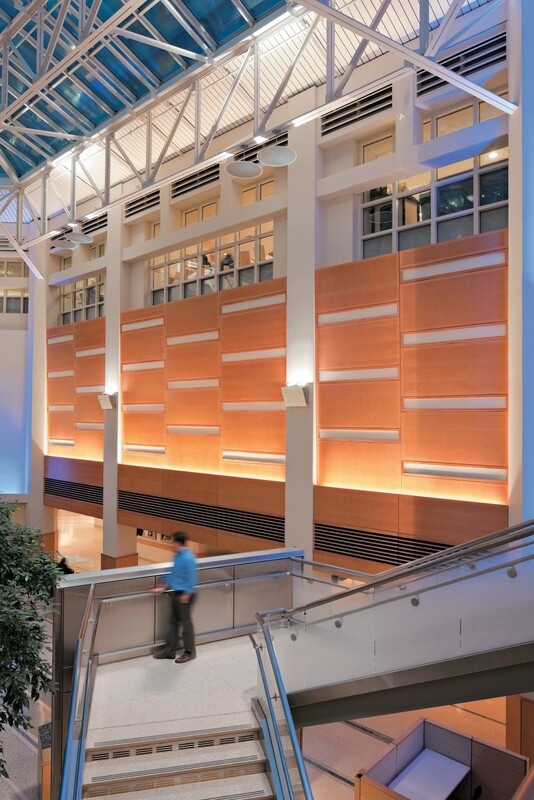 Lighting designer Lam Partners of Cambridge MA chose Lumenfacade wall washing luminaires to illuminate the atrium of the Yale-New Haven Hospital (YNHH), creating a welcoming hub with a relaxing atmosphere and improving way-finding for visitors and patients. A large teaching hospital with four buildings joined to an atrium wanted to create a welcoming and vibrant space that visitors could navigate easily. 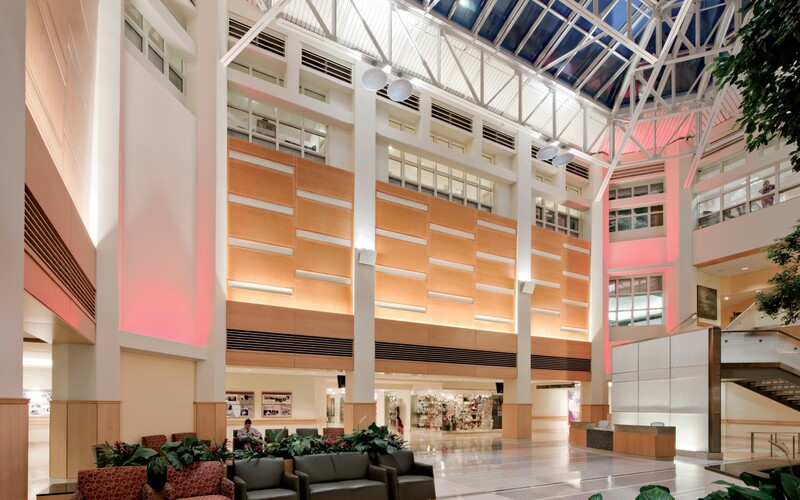 Lighting designer Lam Partners of Cambridge MA chose Lumenfacade wall washing luminaires to illuminate the atrium of the Yale-New Haven Hospital (YNHH), creating a welcoming hub with a relaxing atmosphere and improving way-finding for visitors and patients. YNHH is the primary teaching hospital for Yale School of Medicine and Yale School of Nursing and the largest hospital in the state. The newly renovated, three-storey atrium is the focal point in welcoming patients to the hospital. 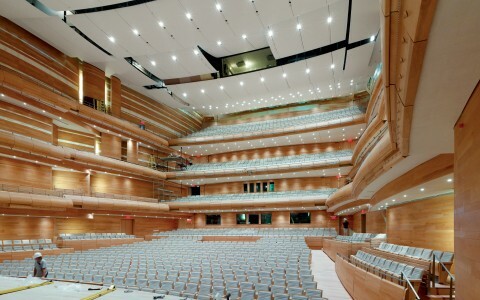 It is important for visitors to be quickly oriented as the atrium links four ‘pavilions'. 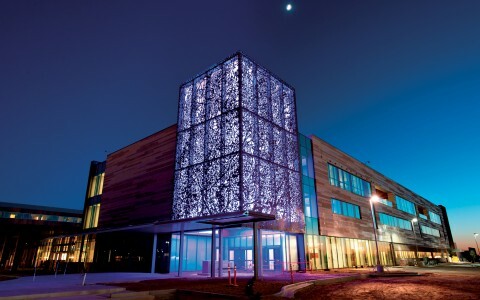 Using Lumenfacade Remote Color Changing fixtures, each building's entrance is now identified by color-changing illumination and the reception desk is easily located. 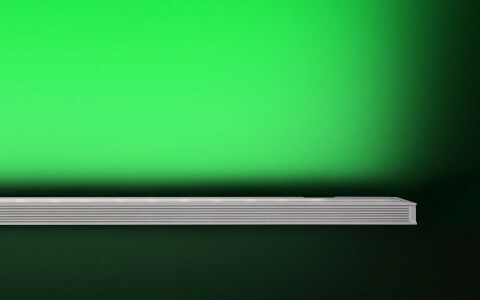 Each atrium corner above the pavilion entrance, is grazed with its own color or a series of colors, controlled using a Lumentouch™ Intelligent Control Keypad. 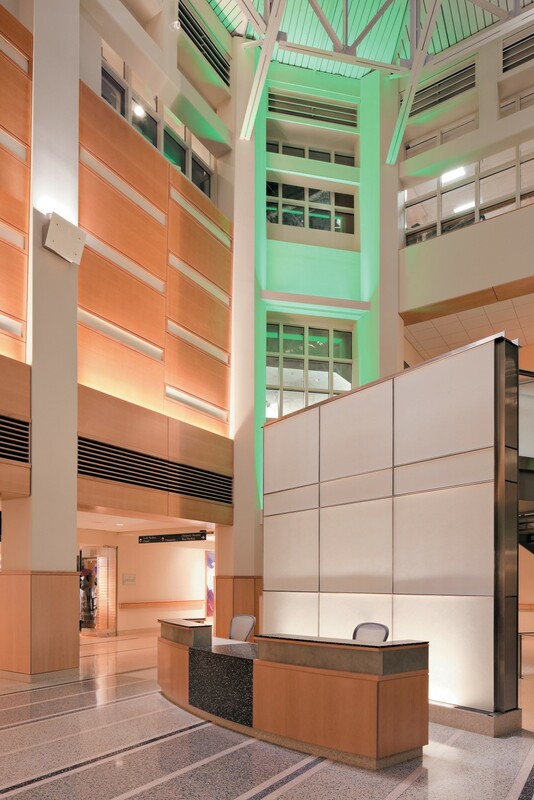 Lumenfacade fixtures provide white LED light with a warm color temperature of 3000K that now grazes the freestanding stone wall behind the reception desk, making it a focal point. 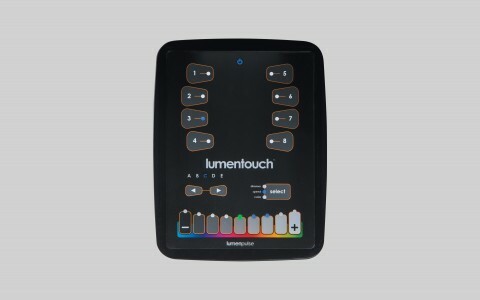 The Lumentouch control panel behind the information desk adjusts the white light in the atrium to suit the levels of natural light available at any time of the day or night. 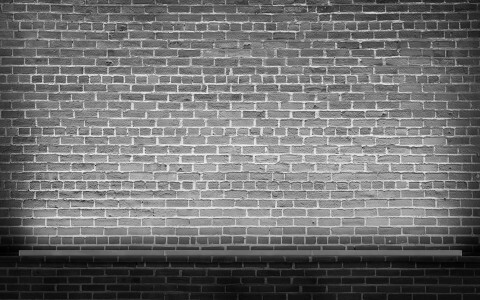 The white light grazing the elegant wood-paneled walls is carefully focused with narrow beam optics to avoid glare from viewpoints at any height. 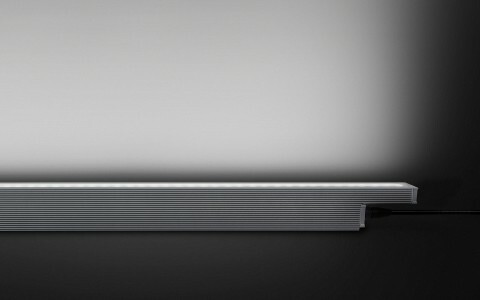 Lumenfacade's dual chamber design reduces maintenance by improving heat control and extending the luminaire's lifespan. Lam Partners installed the fixtures no more than 12 foot above the ground so that regular ladders could be used for maintenance to avoid any damage to the new terrazzo flooring.